The influential lock has returned to Saracens to continue to recover from a knee injury. 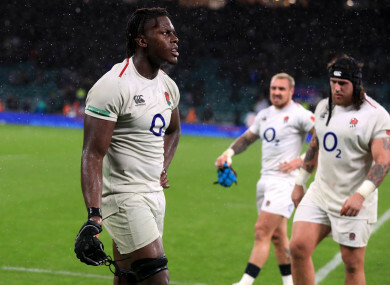 MARO ITOJE HAS been ruled out of England’s potential Guinness Six Nations championship-deciding clash with Scotland at Twickenham. Saracens lock Itoje has rejoined his club to continue his recovery from a knee injury after being left out of Eddie Jones’ 31-man squad for Saturday’s encounter (5pm kick-off). The 24-year-old sustained knee ligament damage in 32-20 win over Ireland on 2 February and sat out the victory over France and the 21-13 loss to Wales in Cardiff before rejoining England’s training squad ahead of their mauling of Italy last weekend. However, he limped out of a training session last week and was subsequently ruled out of England’s 57-14 win. Bath second row Charlie Ewels retains his place in Jones’ squad, which also includes uncapped quartet Ben Earl, Elliott Stooke, Marcus Smith and Ollie Thorley. England can win the Six Nations if they beat Scotland and Wales fail to beat Ireland in Cardiff. Email “Itoje ruled out of England's final Six Nations encounter”. Feedback on “Itoje ruled out of England's final Six Nations encounter”.